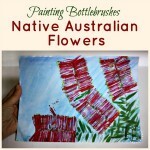 Golden wattle craft for kids: hands on way for kids to learn about our beautiful Australian national flower. 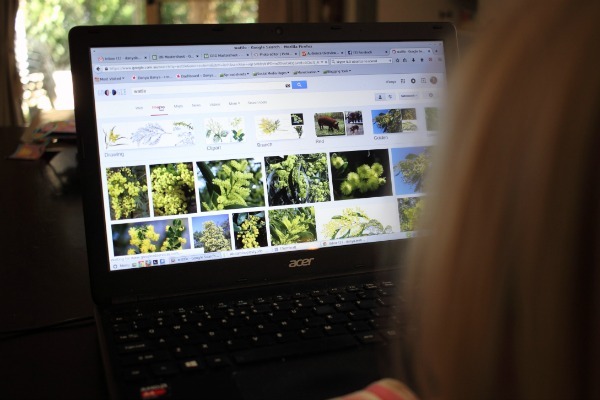 So when a few of my international blogging friends decided to get together and Tour The World By Flower, I just knew I wanted to jump on board, especially because our national flower is such an awesome one! 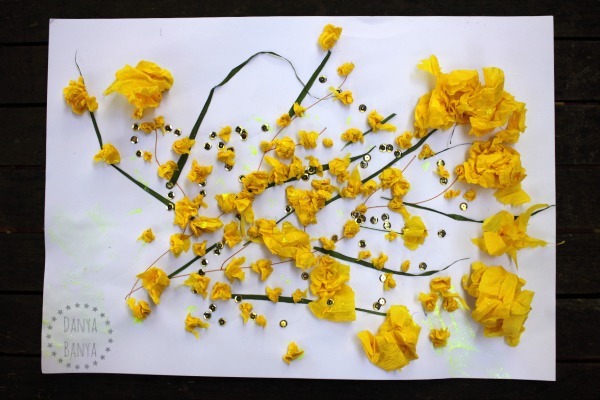 Did you know that Golden Wattle (or Acacia pycnantha) is the official floral emblem of Australia? I love wattle. I love the sprays of bright yellow that line the highways, signalling the end of winter and the promise of an approaching spring. I love it’s unruliness; a beauty that won’t be tamed. I think it’s one of those things that feels quintesentially Australian. 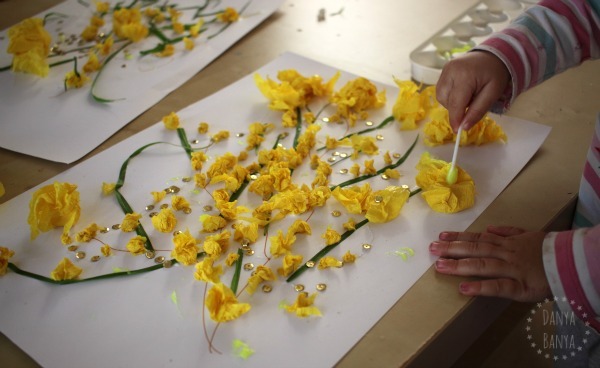 And it’s the beautiful unruliness that makes wattle a great craft subject for young kids. There’s no need for perfection! 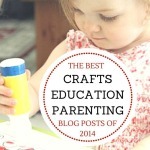 My daughter Bee helped with every step of this craft. At 2 years and 8 months old, she would technically still be called a toddler, but that word hardly seems to describe her any more. Even though she is slightly young to be called a ‘preschooler’, I’m guess this age group would typically enjoy this craft the most. Anyway, here’s how we made it. 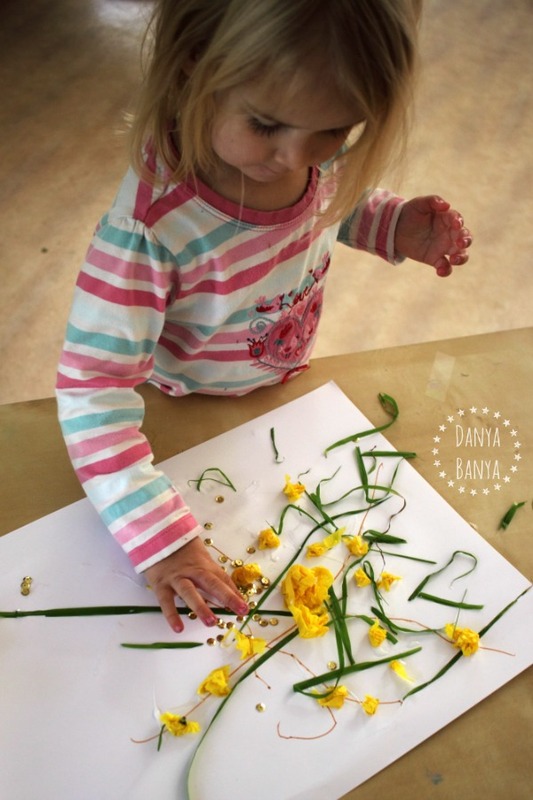 Bee and I drew twig shapes onto A3 paper, and then glued grass ‘leaves’ coming off the twigs. Then we ripped small bits of crepe paper from a streamer roll (left over from JJ’s Rapunzel Party last year). These small bits were scrunched up into little balls, and then dabbed into some glue, and stuck all around the central twig and leaves. 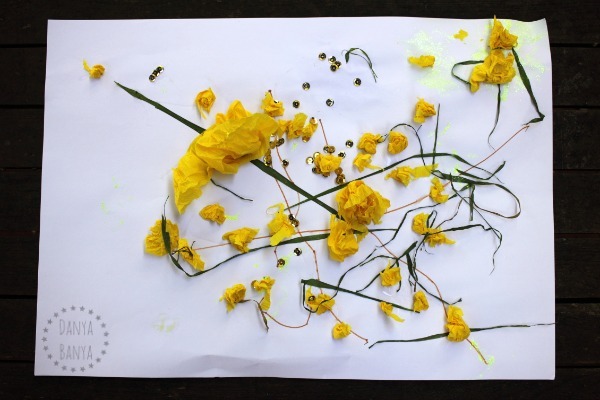 Once we felt we had enough crepe paper wattle balls (or rather, once Bee had tired of tearing, rolling and pasting), I brought out the first of the ‘extra’ supplies. Gold sequins! 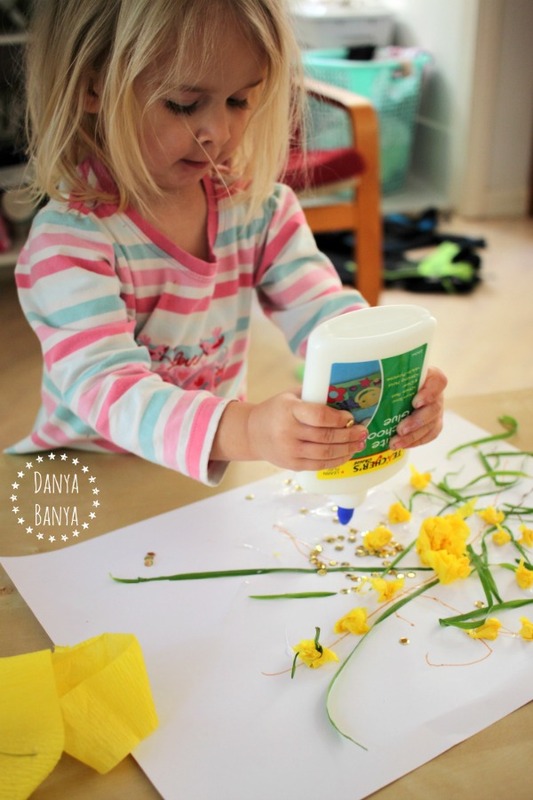 Next was yellow glitter glue – extra sparkles is always a good thing as far as my kids are concerned! Originally there was supposed to be a ‘Bee’ version and a ‘Mummy’ version, but part way through, Bee decided to swap back and forth between the two projects. I kept up the farce just long enough for her to scold me with a few family values. “You do that one Mummy? You need to do helping. We sharing. We do sharing in our family.” Yeah, OK, fair enough. And so we ended up with two very pretty, collaborative wattle crafts. But despite this ending up as a collaborative effort, Bee didn’t actually need a lot of help with this project. 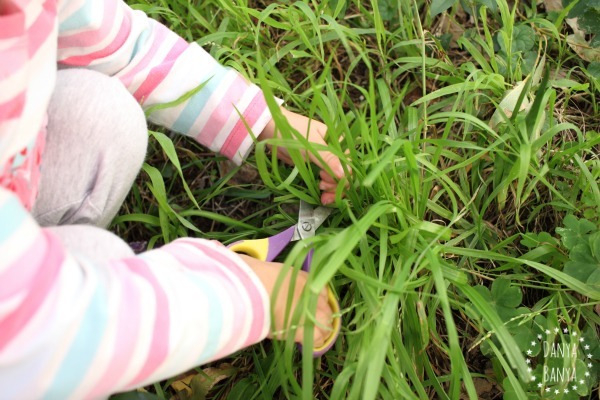 She was able to draw her own twig, cut her own grass and stick it on. 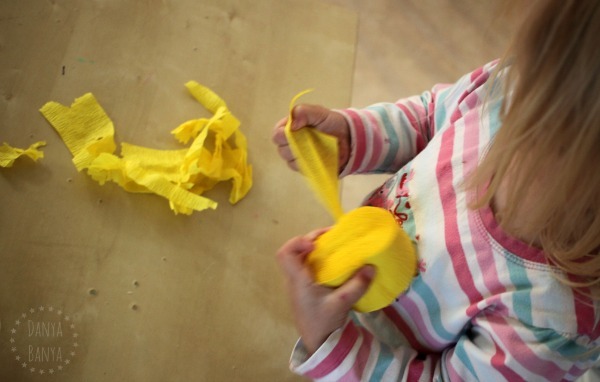 She could rip crepe paper, roll it into a (relatively) tight ball, dab it in glue and paste it on. She could glue on sequins. 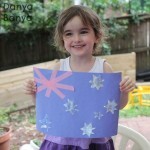 She could add a few glitter glue sparkles using a cotton tip (and later, her fingers). And of course, all that ripping, scrunching, rolling and dabbing, is great for her developing hand control and fine motor skills. 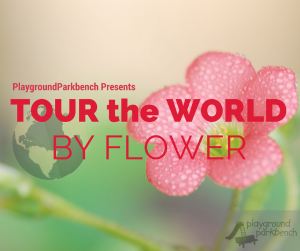 For an international floral craft & geography lesson, pop over to Playground Parkbench’s Tour The World By Flower page. 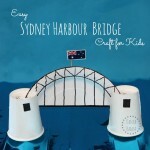 Or if you’re after Australian art and craft ideas for kids, here are a few others we’ve tried. 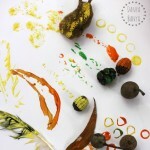 And there’s loads more hand picked (green and) gold on my Australia for Kids Pinterest Board too. 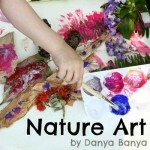 Follow Danya Banya’s board Australia for Kids! on Pinterest. 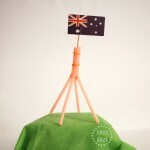 What other Australian crafts would you like to see? We have a bunch of wattle trees at the end of our street. The kids can't wait for them to flower again so we can watch the bees! 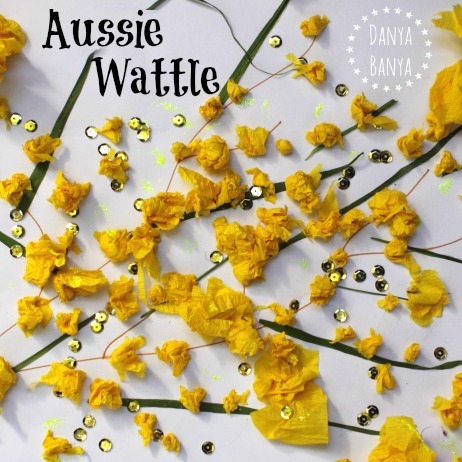 Wattle is my favourite and it's amazing that your craft looks just like it. Gorgeous. I really want to try this. beautiful colours!!! 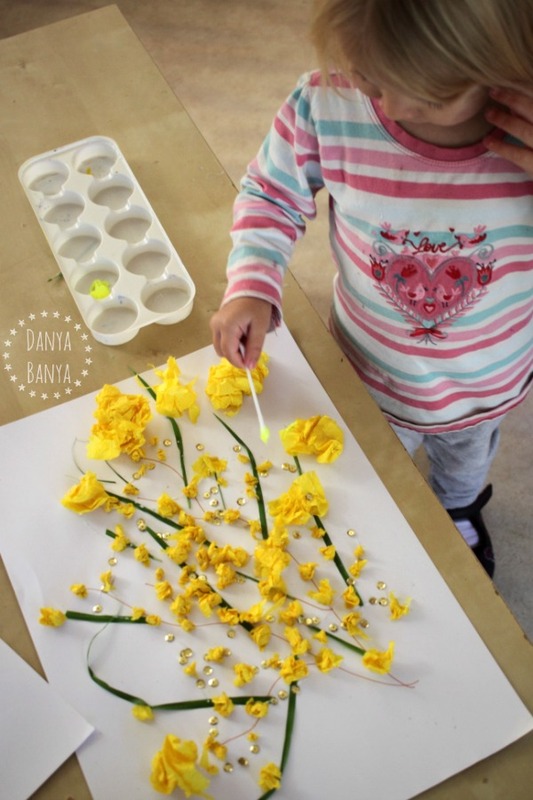 Such a lovely way for kids to create. 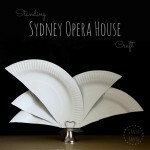 oh gorgeous – just love wattle! can't wait to see it again too. sweet craft! Beautiful! I love the scent of wattle too. "We do sharing in our family." Aw, I couldn't help but laugh at this quote! 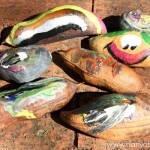 Bee definitely knows what she's talking about– your "sharing" projects both turned out beautiful! Wow! I just love your stuff. 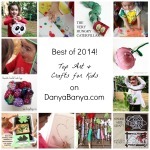 I have so many different craft ideas for kids, but found difficult to handle 1 or 2 year old kids. Because in most of the craft projects we need scissors and other supplies that can be a little bit harmful for 1year old child. But your idea is super awesome and safe. Kids would definitely enjoy. Wattle is my favourite and it's amazing that your craft looks just like it. Gorgeous. Thanks! I have a soft spot for wattle too – like little yellow clouds!